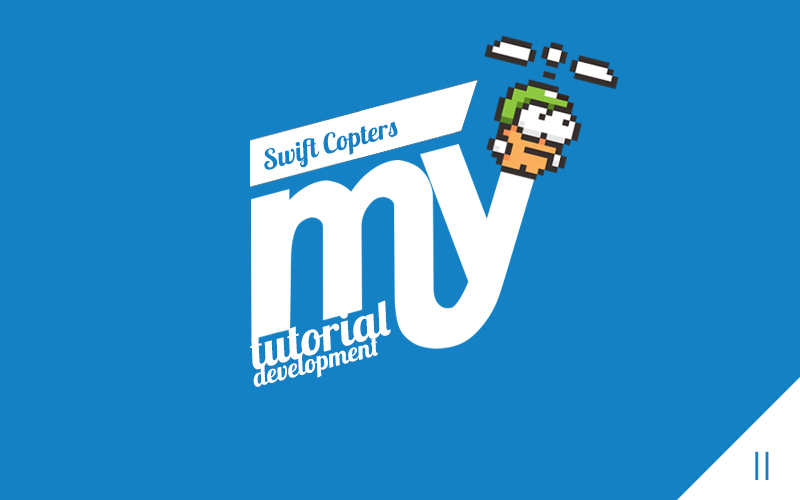 Lets give to our Swift Copter hero some rock & roll! We want to implement the same behaviour of the Swing Copter game: When you tap the screen, the hero change his direction and acceleration direction 180 degrees. If you tap again and again your hero will go up in a little zig-zag. Build and Run! Play a little bit. Have you notice? There are some invisible walls at each side of the screen. However, our hero flies away at the top. But there is a problem, right? We need the camera to follow him! 2. The camera: Follow that dog with a flying hat! SpriteKit doesn’t have a “camera” method to center the scene on a node. They recommend us a trick. We are going to move the nodeWorld (remember, where the rest of the nodes are) in the other way of the hero when the hero moves. As the name of the method says: didSimulatePhysics() is the method that is fired every frame when all the physics calculations and effects have finished. Here we are going to do some more work, but at this time, we are only calling to our method centerOnNode. Build and Launch. See the effect? We are going to generate some enemies to stop our hero. This is an infinite scroll game…so if the player is good, there could be infinite enemies! But we want to take care of the memory of the iPhone so we will need some trick to maintain it low. We can generate 5/10 enemies (the next ones the hero is going to meet)…and when those enemies disappear at the bottom of the screen, we could move them up again to the next position. In this way, we only generate 5/10 objects and reuse them forever. Our enemies will have different sprites: They are composed by a bar and a hammer head at the end. One of this packs in each side of the screen. Let’s create 10 (pairs) of them. So we have to create 10 enemies (let’s use a “for” loop), composed each one by 2×2 spriteNodes (2bar+2hammerHead), which they have their own physicalBodies to detect collisions, and that are going to be reused later. Copy the following method, and call it at didMoveToView func. Our enemies will have a node tree with this node as the parent. In this way, when we want to reposition the enemy to reuse it, we have to move only this node (the father). Here we are creating the Bars. Notice how we use the randomX coordinate generated in point 1. Moreover we use a parameter to specify the distance between both sides on the enemy (you can play with it to make the game easier or harder). We create and attach two hammer heads to both bars. See how we set up an initial rotation, because we are going to animate them! We create the swing animation here. In order to do it right, the anchor point of the nodes should be (0,0). The rotateByAngle action rotates the node with the anchor point as the origin. You can play with it to see the different effects. Add some distance for the next enemy. ditanceFromBarToBar: The vertical distance between two enemies. Node where we are going to add every enemy. Now build and run it again. There should be enemies around you. But after 10 of them…nothing!...we still need to reuse those that are offscreen when the hero has passed through them. See what shouldRepositeNodes does? We get all the children nodes of nodeEnemies (every single enemy was added to this node). With go through that array an for every node, we check if it is under our hero more than 300px (out of screen at the bottom). When that happens, we are moving that enemy to the next lastYPosition+distanceFromBarToBar. An we have a “new” enemy ready to rock our hero! Build & Run…now you should see an infinite game! Have you trained a little bit? Okey! Now it is time for our hero to demonstrate real skills. We are going to detect the collisions. As you imagine, didBeginContact got called when a contact between two physical bodies happen. Then, we check the categoryBitMasks. When one body has categoryCopter (the hero) and the other is an Enemy or the Screen borders…our hero should die! In our game, we are going to transit to another scene, where we will show the user a “game over” text. But remember…our viewController is in charge of the transitions between scenes, so we call him first! Here you can download the full final code from the GitHub project. I have added there two more things: a score node with the points and some animated clouds. But that is your homework! Check them and if you have any questions, let me know in the comments :). I am preparing a video-course with full step by step explanations in video, and much more features for this game template. You could use it to have your own game in the Appstore in 2 days! Do you want to hear about it? Write me! If anyone is attempting this tutorial and finding problems its because the spelling in the code is atrocious among other irritating things such as calling .addChild twice for the same SKSpriteNode – which causes it to crash. Anyway, you can download the github project, it is working as I write this! thank you so much, I have been a iOS developer for a long time and I am developing my first sprite kit game in swift. Thanks to you I have learnt many things. But I am stuck with a very very simple project: 4 nodes in the game scene and 0 nodes in the menu scene. I have simplified a lot my sample to find out a solution. I have a ball in the game scene and its move is very smooth. When i change the scene to the menu scene then I get back to the game scene the move is laggy. Could you please look at my tiny project or just the gamescene.swift. I am willing to pay if you could help me, I have been working on it for many days and I am desperate, that would be very kind of you. Thank you so much in advance!